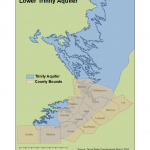 In anticipation of the March 2012 hearings about the Desired Future Conditions for the Hill Country portion of the Trinity Aquifer, the implications of the final decisions for use and preservation of the aquifer are to be determined. Read the news bulletin here. 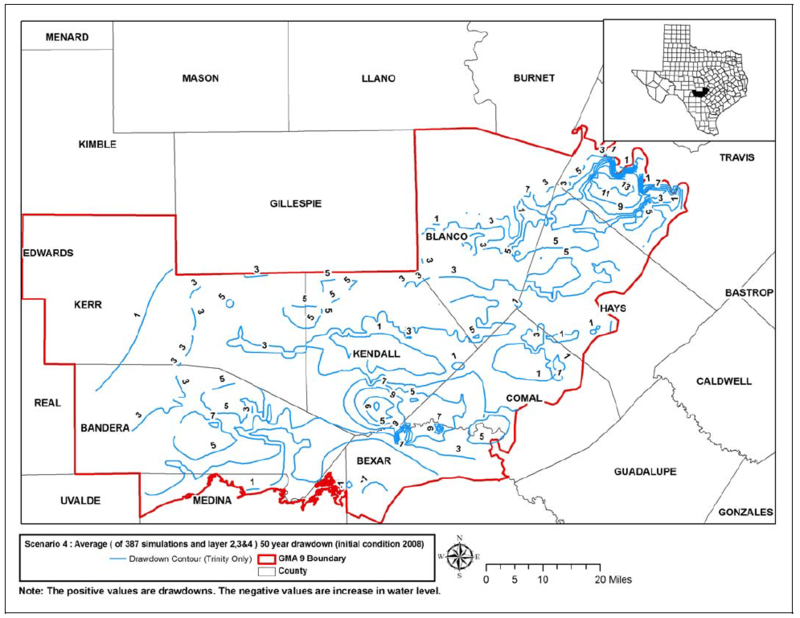 GMA 9 is the area designated for the Hill Country portion of the Trinity Aquifer system (Lower, Middle, and Upper Trinity Aquifers). 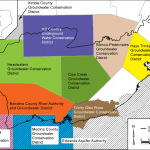 As shown below, there are 9 partial or complete GCDs as well as the Edwards Aquifer Authority that are part of GMA9. 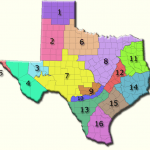 The map also shows the parts of Travis and Comal counties that have no GCD. GMA 8 manages 2 major aquifers, the Edwards Balcones Fault Zone (BFZ) and the northern Trinity, as well as 7 minor aquifers. 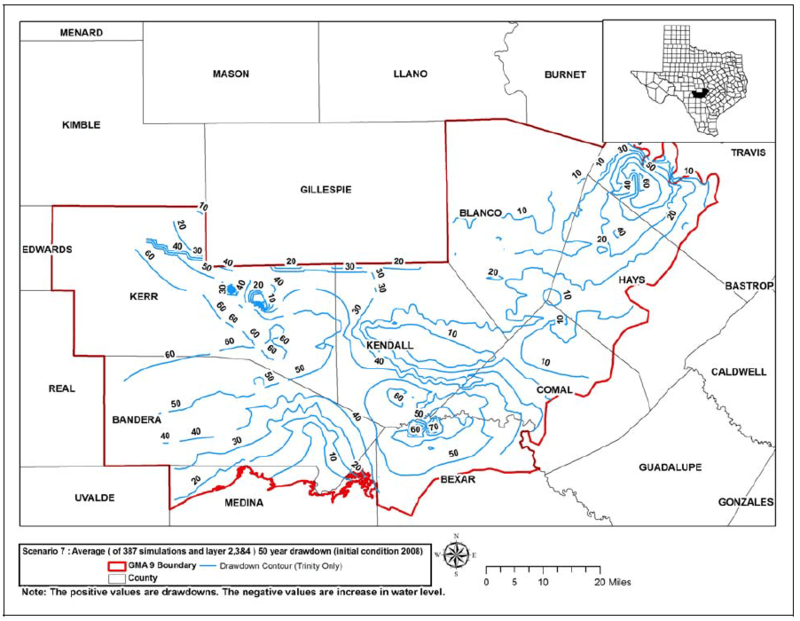 GMA 9 manages 3 major aquifers, the Edwards (BFZ), the Edwards-Trinity (Plateau), and the Hill Country portion of the Trinity. Three minor aquifers are also in the GMA 9 jurisdiction. 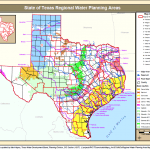 -Regional Water Planning covers 16 areas that focus on major river basins. GCD and GMA data and information about the major and minor aquifers, their models, known and projected uses of groundwater, and groundwater demands and modeled available supply, are provided during each 5-year cycle of planning. The State is currently in their 3rd RWP cycle and has placed the Draft “Water for Texas 2012” online as well as holding meetings for public comment. 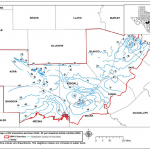 A key part of managing aquifers in Texas is currently underway. Each aquifer, or portion of an aquifer, has undergone several rounds of groundwater modeling. Various model scenarios that test assumptions about recharge, current and future pumping, water levels under drought conditions, etc., have been run and are continued to be evaluated. The information gained through these critical models are used by GCDs and GMAs to assess how to manage each aquifer. GCDs come together through the oversight of the GMA as a whole to discuss aquifer conditions, issues, and future groundwater demands and supplies. The GCD members therefore must agree on how the aquifer is managed at the GMA level. The Desired Future Conditions (DFCs) are “the desired, quantified conditions of groundwater resources such as water levels, water quality, spring flows, or volumes) at a specified time or times in the future or in perpetuity” (TWDB 2008 report on DFCs). As such, DFCs are intended to answer the question of each GCD and GMA – how do you want your aquifer to look in the future? Of course, the tough part is in the details. 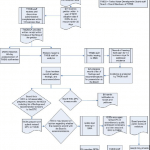 Below is a link to the DFC flow chart, available as a downloadable pdf at the TWDB. In short, the GCDs in a GMA adopt a set of DFCs. Should an entity in a GCD disagree with the “reasonableness” of one or more of the adopted DFCs, a petition may be filed with the GCD within 11 months of the DFC adoption date to appeal the DFC. Should the GCD not resolve the DFC petition’s issues within 30 days, the petition will be submitted to TWDB. A series of reviews and hearings will then commence, including technical evaluation of submitted evidence that the DFC is reasonable or not reasonable. 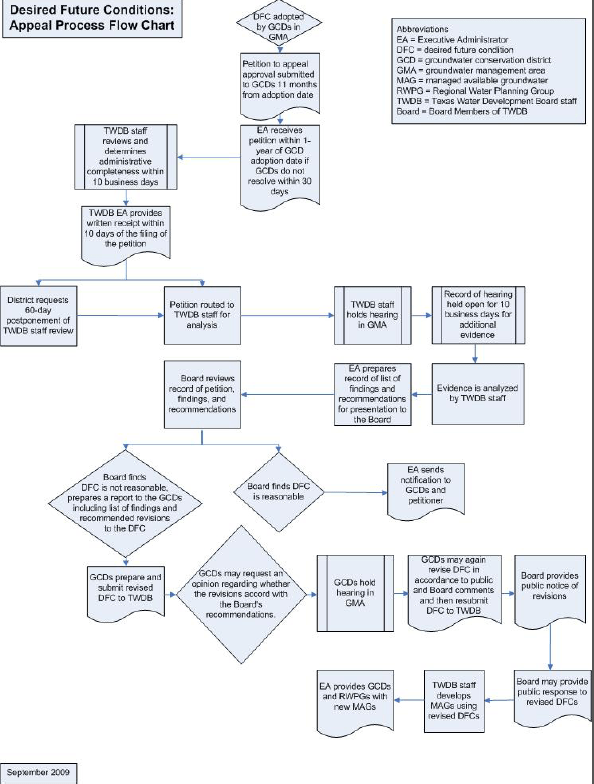 The DFC process has been underway for the past few years, and in 2009-2011, reports on the DFC model runs and results have been available on the various GMA webpages. Some of these decisions are also undergoing petitions to appeal the reasonableness of a DFC. 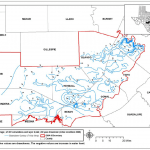 In GMA 9, two petitions are currently undergoing public hearings on the GMA9-adopted reasonableness of allowing an average 30-foot drawdown of the Hill Country portion of the Trinity Aquifer over a 50-year timeline (see TWDB GMA 9 Home page under “Petitions” for a downloadable pdf of the two petitions). In each of these scenarios, draw downs are projected to be deepest in the areas of highest pumping such as southwestern Travis County and northwestern Bexar County. Draw down may also be fairly steep in the up dip areas of the aquifer where the water-bearing rock layers thin in Kerr County. This site will be updated as the petition hearings and the technical reports are made public – stay tuned!